Let me bring you HaloMD: an attempt to bring Halo Demo into the modern age. In other words, a much improved unofficial update to the free Halo Demo that also runs on new Macs. *This uses our own lobby. 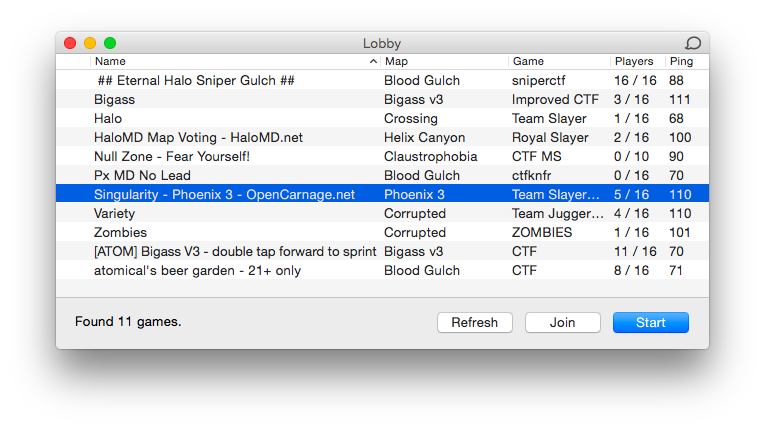 You host games in-game normally, but join games via the launcher. *This includes Blood Gulch, Barrier, Crossing, and one campaign level - The Silent Cartographer. **It's easy to install and play other multiplayer mods too. You can view the HaloMD lobby on the web over here. I will be posting beta versions. HaloMD requires intel OS X 10.7 (Lion) or later to run, but there are older versions for 10.6 and 10.5 intel. If you're interesting in porting or making mods for HaloMD, you will need to check out MDRenamer. If you are interested in MD's source code, it is available on GitHub. Last edited by nil on Sun Aug 16, 2015 1:31 pm, edited 84 times in total. 1. If HaloMD is able to post servers, why can't it read the HaloMD lobby instead of Halo Full? 3. You can use a packet sniffer to find data sent to the gamespy server. Samuco wrote: 1. If HaloMD is able to post servers, why can't it read the HaloMD lobby instead of Halo Full? 1. HaloMD is modified to using HDM as the server instead of the gamespy server. It contacts a server script I wrote that is running on HDM. The server script does not exactly replicate the server list request gamespy uses. It is just kind of difficult to figure out how to load HaloMD lobby inside the game. The gamespy lobby sends a multiple of UDP packets (sending each one multiple times to make sure they send properly, probably) each containing something like the IP address and port of a game, and the IP and port to the next game to check, and Halo responds back in some acknowledgement manner - but all the data is encrypted, so that makes it all the more challenging. I haven't given much thought to this though, I will check out if I can figure anything out. 2. It is possible to modify the executable such that it loads the Demo or Trial lobby inside the game, but that provides no real benefits because the netcode is incompatible and you won't be able to play with such players. 3. A packet sniffer was used in our research, and I had needed one to create this. Much of our other research was posted in this thread. I had thought you jumped off a bridge and disappeared, man . halo pc players can join? nil wrote: 1. HaloMD is modified to using HDM as the server instead of the gamespy server. It contacts a server script I wrote that is running on HDM. The server script does not exactly replicate the server list request gamespy uses. It is just kind of difficult to figure out how to load HaloMD lobby inside the game. The gamespy lobby sends a multiple of UDP packets (sending each one multiple times to make sure they send properly, probably) each containing something like the IP address and port of a game, and the IP and port to the next game to check, and Halo responds back in some acknowledgement manner - but all the data is encrypted, so that makes it all the more challenging. I haven't given much thought to this though, I will check out if I can figure anything out. nil wrote: 2. It is possible to modify the executable such that it loads the Demo or Trial lobby inside the game, but that provides no real benefits because the netcode is incompatible and you won't be able to play with such players. nil wrote: I had thought you jumped off a bridge and disappeared, man . I PMed it to you. Not going to open source this stuff yet. [EDIT]: Updated to support leopard (intel). Hello, HaloMD is a good job, i love it ! But always no games found : ( Because no players ? And when i create a game, i see my server in HaloMD window ==> "Game Name: Players: ?????? Gametype: ?????? Access: ?????? Ping: ?????? Server Address: (my ip:port) " its normal ? TheStrangeGuest wrote: But always no games found : ( Because no players ? TheStrangeGuest wrote: And when i create a game, i see my server in HaloMD window ==> "Game Name: Players: ?????? Gametype: ?????? Access: ?????? Ping: ?????? Server Address: (my ip:port) " its normal ? You may not be able to host a game because you're likely behind NAT, which means you probably have to do port forwarding on ports 2302 - 2303 UDP. If you're on a network that you don't own, this may not be possible. You'll find this issue hosting for any kind of video game. Short explanation: For now, it may be normal. . Have someone try joining your game. If he can't join, you'll need to try port forwarding. I guess I'll host one leave it up all day as dedicated. EDIT: It's up, you can join whenever. EDIT 2: I'm also on Mumble. Modzy, what's the status of Pearl 2.0 and its conversion capabilities between Halo Demo and Halo Full? Slapzy, GvN, Taxi... myself included, you've got lots of options for artists for the icons, graphics and whatever. Also, nil said this build will expire tomorrow, so I'll be hosting all day today. HaloMD means "Halo Mini Demo", right? I'm thinking about the icon... maybe a masterchief helmet in the mouth of a Lion? Or masterchief helmet with the mane of a Lion colored around it? Or a graphical representation of a shrunken helmet? Eh... or a helmet on the left side, a lightning bolt to its right in the middle area as a divisor forward slash "/", and lots of mini helmets on the right side? 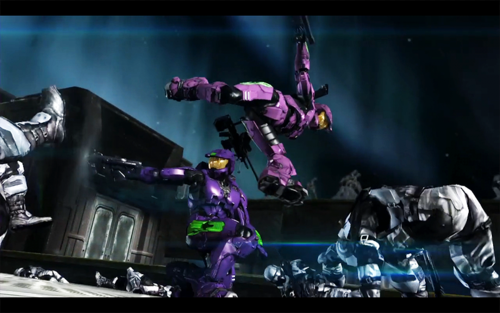 EDIT 4: Looks like I'll be releasing Galaxy Wars as a Halo Full mod rather than a Halo Demo mod after all. Well, that will do better with cross-platform issues anyway. This makes me wish I had my computer. can we go over the 16 player limit? good job nil. i asked Roger Wolfson about that, and we'll see what he says. Joined sparky's game as some weird name "walla walla"
EDIT: Hit "start" and edited all the settings. Rejoined sparky's game and had a great time haha, thanks nil. Last edited by Amy on Fri Feb 17, 2012 11:39 am, edited 1 time in total.